What is the fastest way to create a new folder in the Windows operating system? That depends on the version installed. Windows 7 users for instance can use the new folder shortcut Ctrl-Shift-n in Windows Explorer to create a new folder instantly. That shortcut is not available in previous Microsoft operating systems on the other hand. A new folder shortcut on those operating systems is the keyboard combination ALT, F, W, F in Windows Explorer which follows the top menu to create a new shortcut. That is not as practical as the Ctrl-Shift-n shortcut but still better than using the mouse to create a new folder in the Windows operating system. Windows XP users can also make use of a little software program called mdAxelerator. The 6K program can be used to map the creation of a new folder to a shortcut. It can even be used to change the default name of that folder as well. Do you use another way to create new folders in Windows? Let us know in the comments. 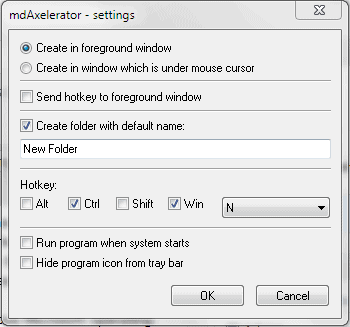 Update: mdAxelerator has been discontinued, probably because it is not possible to create new folders under Windows 7 with the keybord shortcut Ctrl-Shift-n.
Easy: Use FreeCommander (or something similar) because, honestly, it’s way better than Explorer, and then hit F7. Bam — new folder. New files can be created with Ctrl-Shift-N.
What’s wrong with ALT+F, W, F? Unfortunately for me, the Windows 7 shortcut stopped working some time ago. This may come in handy. Thanks. a program called “bxnewfolder” found at http://www.baxbex.com/products.html. i have this installed on every computer i own and always will (until i upgrade to win7).